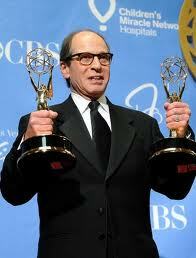 Harry Friedman, Writer and television producer, multiple Emmy winner, Omaha, NE. Harry Friedman was born in Omaha, Nebraska. He developed an early fascination with television programming and personalities, including fellow Nebraskan, Johnny Carson, when he was a young local celebrity. Long before the conception of student internships, Friedman began working for Omaha’s first television stations, doing whatever work management permitted. In 1971, Friedman moved to Los Angeles, and became a part-time question writer on The Hollywood Squares.Â He went on to become the executive of producer of some of the highest-rated game shows such as Wheel of Fortune in 1995, and Jeopardy! in 1997, and earned a total of 12 Daytime Emmy Awards. Won Daytime Emmy for Outstanding Game/Audience Participation Show (2012).Â Jeopardy!. Won Daytime Emmy for Outstanding Game/Audience Participation Show (2011).Â Jeopardy!. Won Daytime Emmy for Outstanding Game/Audience Participation Show (2006).Â Jeopardy!. Won Daytime Emmy for Outstanding Game/Audience Participation Show (2005).Â Jeopardy!. Won Daytime Emmy for Outstanding Game/Audience Participation Show (2003).Â Jeopardy!. Won Daytime Emmy for Outstanding Special Class Writing (2003).Â Jeopardy!. Won Daytime Emmy for Outstanding Game/Audience Participation Show (2002).Â Jeopardy!. Won Daytime Emmy for Outstanding Special Class Writing (2002).Â Jeopardy!. Won Daytime Emmy for Outstanding Audience Participation Show/Game Show (1998).Â Jeopardy!. Won Daytime Emmy for Outstanding Special Class Writing (1998).Â Jeopardy!. Won Daytime Emmy for Best Writing for a Game Show (1974).Â The Hollywood Squares.